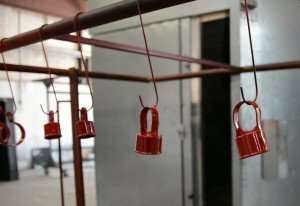 One of the keys to successful powder coating application is proper grounding. A good ground acts like glue to the powder being sprayed on the part, making it easy to get a uniform, high-quality finish with high transfer efficiency. A weak ground can cause a host of issues, such as light coverage areas, Faraday cage problems, larger hook marks, generally uneven powder application, dirtier spray booth filters, and poor transfer efficiency. In extreme cases, improper grounding can cause the operator to get shocked. Grounding Rod. We have mentioned in previous articles that the best starting ground for manual spray applications is a 6’ to 10’ copper grounding rod installed just outside of the powder spray enclosure. Permanently attach a ground strap of at least a 14-gauge wire with a good clamp on the end that will be used to ground parts. 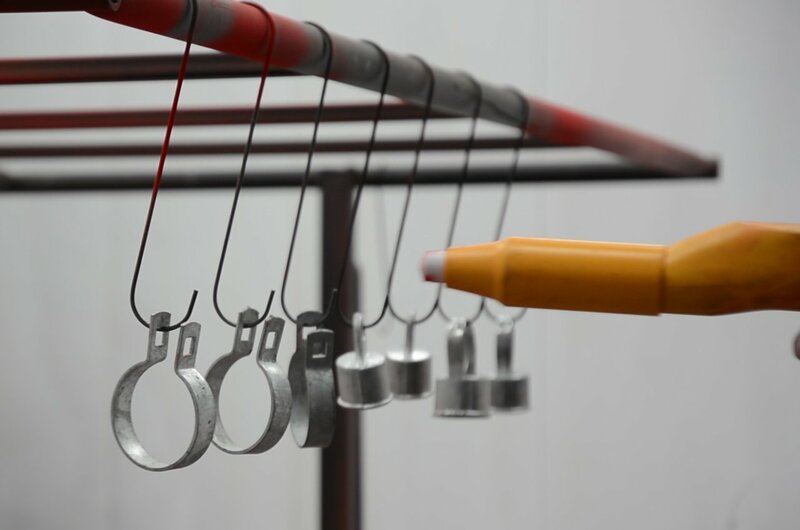 When the ground rod is in rather sandy or dry soil, a small amount of water can be poured into the grounding rod hole and allowed to soak in prior to powder coating. 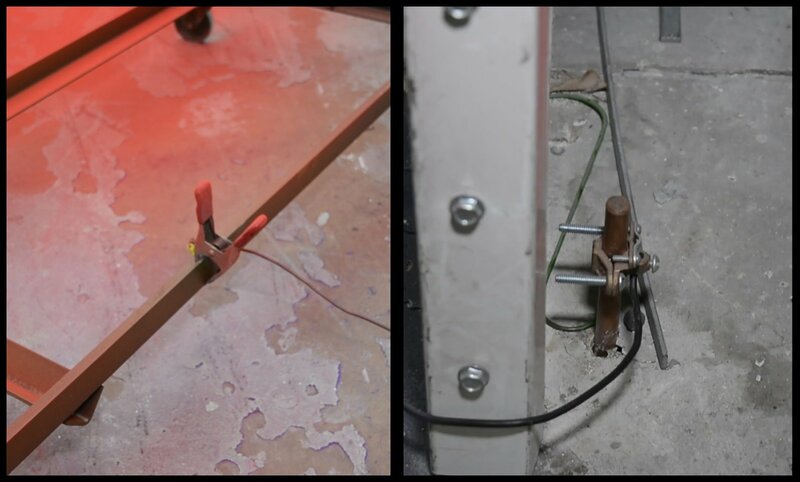 For the best ground, make sure your clamp (left) is attached to a copper grounding rod outside the spray booth (right). When using this grounding method, the powder will stick to the part like glue. The powder will resist being shaken off when moved or when encountering mild air movement. IMPORTANT: Using just the grounding clamp supplied with the gun unit is inferior to using a grounding rod, but it’s better than nothing until you get your grounding rod installed. Parts Rack or Cart. You will need good metal-to-metal contact from the grounding rod clamp to the part. If you clamp the cart in the same place each time, be sure to blow or wipe off the powder around the clamp attachment area each time BEFORE the cart enters the curing oven. This will prevent you from having to grind off this area every time you use the cart. When parts are attached directly to the rack or cart frame, metal-to-metal contact is usually achieved by the part shielding the rack’s contact points. It’s important to note that if you do not hang parts on every contact point, powder will accumulate on the exposed points and will have to be removed before using the rack again. Some operators use high temp tape or other masking agents to protect areas of the rack from powder that can become baked over the exposed metal. If you use racks that have movable hooks to attach the parts using a bar or similar contact points, you need to grind the tops of the bars every 5-6 coating cycles. This will ensure a good ground and proper transfer efficiency. 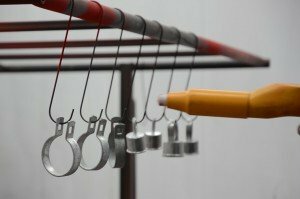 If you hear popping sounds while applying the powder or see small instances of electrical arcing from hook to rack, flag that rack to be cleaned via grinding or stripping before using it in the next coating cycle. Racks can usually be manufactured by any local metal fabrication shop. Many job shops make their own. When designing racks or carts, remember to concentrate parts so they are two feet from the floor to about six feet high. This will allow the operators to spray all areas fairly easily. Parts. Not all parts ground well. Because of their mass, some parts can be tough to ground properly. Also, if parts have been coated before, they can be more challenging to ground. Sometimes the racks don’t ground parts adequately because the parts hang too far from the grounding point. In these cases, you can clamp directly to the part in question. After spraying the powder, just remove the clamp and spray the clamped section last to keep from getting surface defects. If you’re worried that you might not be getting a good ground, use a megohmmeter (often called a “megger” after the company that makes these types of test instruments: http://us.megger.com/) to check the resistance from area to area. If the resistance exceeds 1 megohm from ground to part, work backwards at all the contact points to determine where the loss of ground is occurring. Using professional quality powder coating equipment can solve many of your coating issues. 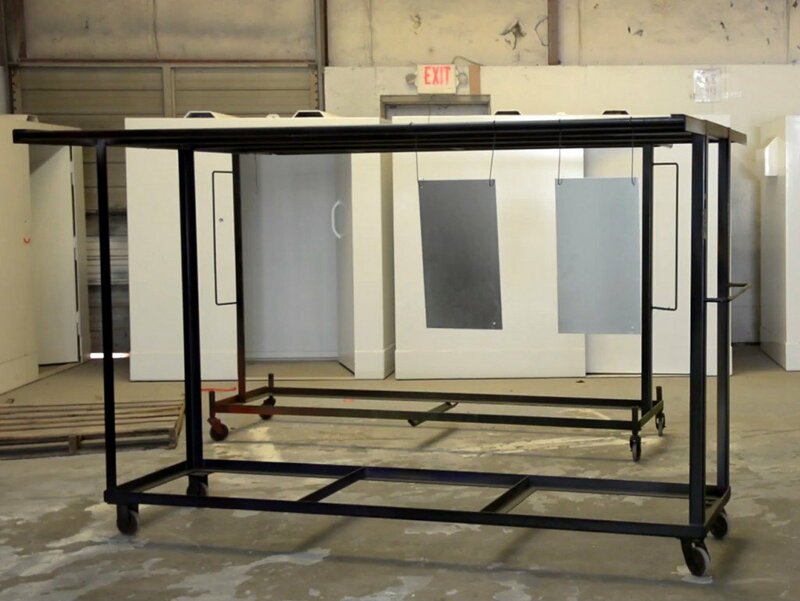 All of Reliant Finishing Systems’ equipment is designed to provide the best finishes possible for today’s powder coating operations. Find out more about Reliant equipment here, or give one of our systems specialists a call today. This entry was posted in News on July 20, 2016 by Bruce Chirrey.